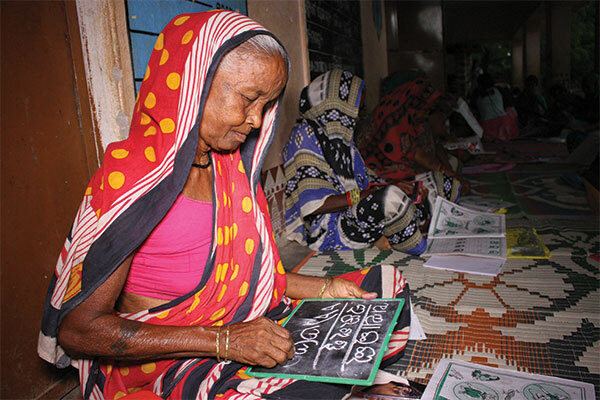 Adult literacy classes were conducted for four months for SHG members in the tribal areas of Kerala, Orissa and Uttarakhand. It is being taken to many other villages across India. With the use of tablets and other teaching aids, the women mastered the alphabet and learnt numbers, addition and subtraction. They were taught to write and read simple sentences, and recognize bus and road signs. This allows them more mobility, to visit their family and children. It also ensures that they do not get fleeced by unscrupulous shopkeepers, as they can now read the amount for each item and add the total amounts for themselves. Amrita CREATE of Amrita Vishwa Vidyapeetham developed and implements the programme.